Starting Sunday in about 2,500 stores Walmart would be selling Apple iPhone 3G with the 2 year usual service agreement with AT&T. The phones to cost $197 for the black 8GB model and $297 for the black or white 16GB version. As you can see it price 2$ less then the usual price of 199$ and 299$ respectivelly. 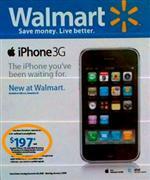 Wal-Mart employees will guide thro Apple iPhone 3G kiosks for customers. You can find them in the Wal-Mart Connection Center where the home entertainment department is located in the store. Whats AT&T doing to beat the 2$ discount ? AT&T is selling a refurbished 8GB iPhone 3G in black for $99 which had a previous price tag of $149.